MegaLong™ isolates high molecular weight genomic DNA from a variety of samples, including animal tissues, cultured cells, whole blood, bacterial and yeast. MegaLong™ uses Genomic Tube-O-DIALYZER™, a micro dialysis device with a 0,45 μm membrane that minimises sample manipulation, one of the main reasons for DNA breakage. 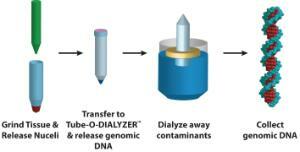 Nuclei are isolated under mild extraction conditions and genomic DNA is released by digestion of nuclear proteins with a highly active LongLife™ Proteinase K. The digestion is performed in the Tube-O-DIALYZER™ and after digestion the Tube-O-DIALYZER™ is inverted to dialyse away digested protein and other impurities leaving behind highly pure and fully hydrated genomic DNA. The fragile, high molecular weight genomic DNA can be stored in the Tube-O-DIALYZER™ to further minimise mechanical manipulation of the DNA. The DNA is suitable for Southern blot analysis, recovery of Lambda shuttle vectors from transgenic animals, PCR, analysis by pulsed-field electrophoresis or any application where genomic DNA is required.